Qualtra Pharmaceuticals name relates to high quality products and services. The constant, high quality level of our products is based on our good relationship with our providers/manufacturers and on the knowledge they have about the meaning of Qualtra that means quality with the latest scientific developments and their technical applications. We bring to the world pharmaceutical and health care products that improve lives and deliver outstanding value to our customers. Enhance the quality of life for humankind by providing innovative and trusted ingredients to the healthcare industry. Qualtra Pharmaceuticals strives the best by meeting the technological and scientific needs of the society, government & industry . For those individuals who prefer something natural for their teeth, there are many types of herbal toothpastes on the market. Herbal dental products are made from natural ingredients and some are even certified as organic. There is absolutely no difference in texture or consistency of these toothpastes when compared to the conventional toothpaste currently available on the market. However, the two major differences between natural toothpastes and the other toothpaste are the color and flavor. Most natural toothpastes do not look pristine white but have a range of colors. These toothpaste many not appear appealing initially but they function just as great and keep the teeth clean for a long time. The other distinct difference about natural toothpastes is their flavor. Consumers have started to switch over to natural toothpastes chiefly because they want natural ingredients. All regular tooth pastes come with many different synthetic chemicals, dyes and artificial flavors. With the herbal products, all you get are natural herbs and plant extracts. Dentosoft® uses 'concentrated' rare herbs and oils so effectively for soothing troubled gums, protecting teeth and adding 'extended' freshness all through the day. Recognizing the power of nature's gifts, we a natural based, herbal toothpaste which has been manufactured using extracts and oils of natural ingredients that helps you maintain your oral hygiene. Dentosoft® contains extracts of Neem, Clove, Babool, Majuphal, Catechu and other rare herbs and natural extracts. It has oils of coriander, ginger, lemon, and spearmint among other essential natural oils. Dentosoft® toothpaste is an ayurvedic toothpaste made of rare herbs and fruits that have been shown to have great effect on oral health and hygiene. Dentosoft® toothpaste that has been based on ancient, well documented ayurvedic medical formulations and years of indigenous research. The values of ayurveda have been represented in the properties of these herbs. 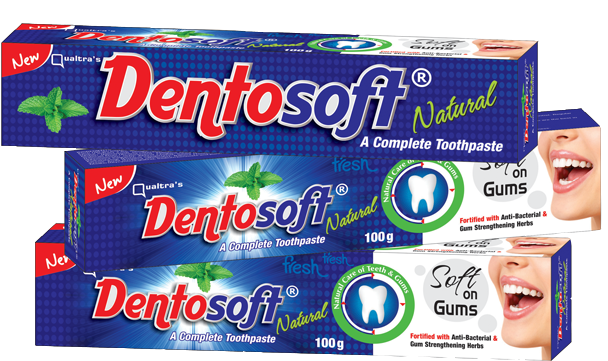 Dentosoft® toothpaste uniqueness lies in its herbal parts that are highly concentrated and readily soluble in saliva. The power to penetrate mucous membranes is multiple times that of natural toothpowders and toothpastes. It gives tremendous protection against cavities and other dental and gum problems. The primary acid-tolerant bacteria associated with dental plaque including Streptococcus mutans, Streptococcus oralis, Streptococcus sobrinus, Lactobacillus acidophilus, Streptococcus salivarius, Streptococcus mitis, Streptococcus sangui, Streptococcus intermedius, and Streptococcus anginosus that surround orthodontic appliances are a common problem in many patients undergoing orthodontic treatment. It has also been reported that presence of fixed orthodontic appliance greatly inhibits oral hygiene and creates new retentive areas for plaque and debris. Ethanolic leaf extract of Azadirachta indica in Dentosoft ®Natural shows significant antibacterial activity against selected acidogenic oral bacteria causing dental plaque in fixed orthodontic appliance patients. The study conducted by clinicians evaluated the anti-plaque activity of the extract against S. mutans, S. sanguis, and S. mitis. The extract did not inhibit L. acidophilus when tested. Sodium hypochlorite has been used as root canal irrigant for decades; it causes potential weakening of the tooth structure by decreasing the hardness and structural integrity of the dentin within the root canal. To overcome this disadvantage herbal drugs are used effectively to inhibit E. faecalis that causes root canal failure in patients undergoing endodontic treatment. Aqueous and ethanolic extract of Neem leaf inhibits S. mutans and E. faecalis which cause root canal failure in endodontic procedure. Its antioxidant and antimicrobial properties makes it a potential agent for root canal irrigation as an alternative to sodium hypochlorite. Literature suggested that the Neem (Azadirachta indica) leaf extract has significant antimicrobial effect against E. faecalis derived from infected root canal samples. The extract was found to be efficacious compared with 2% sodium hypochlorite. Regular brushing with Neem-containing Dentosoft ®Natural toothpaste will reduce the deposition of plaque, prevents caries, and enhances the immune response for overall oral health. Frequent usage of mouthwash Dentosoft ®Natural containing Neem extract will lessen gingival problems, and also treats halitosis. In this modern, trendy world, we have done enough damage to nature. It is high time we start changing ways, to synchronize ourselves with nature, providing ample space for each other. Here we are trying to retrieve and learn the ancient Indian ways, which can still be infused into our fast-paced lives for a good effect, benefitting our future generations to come. This article hopes to lay a good solid base for further uses of one of nature's best gift—Neem in many more day-to-day functions. If education can be provided in dental and dental hygiene schools about the use of Neem-based Dentosoft ®Natural and also herbal oral care products, it would help our dentists treat patients more holistically. Ocimum sanctum in (Dentosoft ®Natural) is equally effective in reducing plaque and gingivitis as Chlorhexidine. The results demonstrated a significant reduction in gingival bleeding and plaque indices in both groups over a period of 15 and 30 days. M. elengi in Dentosoft ®Natural) is known for its strengthening property for teeth. Piper Cubeba in Dentosoft ®Natural) helps avoid having dental cavities and is an effective local antibiotic. Different kinds of cariogenic bacteria, the MIC of caesalpinia sappan lignum was between 5-10 mg x mL(-1), and the MIC of other herbs was above 20 mg x mL(-1). For the eleven kinds of predominant bacteria which normally involved in pulp periapical disease and periodontitis, the MIC of caesalpinia sappan lignum was below 0.062 5 mg x mL(-1), and the MIC of the terminalia chebula retz was between 10-20 mg x mL(-1), and the others were above 20 mg x mL(-1). (A Study) Based on these facts Caesalpinia has good role in controlling Cariogenic Bacteria . The antibacterial activity of acacia arabica was assessed using fresh isolates and reference strains of Actinobacillus actinomycetemcomitans, Capnocytophaga spp.,Porphyromonas gingivalis, Prevotella intermedia and Treponema denticola. A fine aqueous suspension of gum was produced by sonication and then a soluble fraction isolated by centrifugation and membrane filtration. These preparations were incorporated into Columbia agar at doubling concentrations. Growth of P. gingivalis and P. intermedia cultures on the agar was inhibited by whole gum sonicate at concentrations of 0.5–1.0% w/v. Both species showed reduced susceptibility when horse blood was present in the agar. The gum soluble fraction did not inhibit growth of any bacterial culture. The effect of acacia on bacterial proteases was examined with cell sonicates from log phase broth cultures. Enzyme activities were determined by fluorimetric assay with various synthetic peptide substrates. Most protease activities reduced in the presence of 0.5% w/v gum sonicate, with the trypsin-like activities of P. gingivalis and P. intermedia proving most sensitive. The gum soluble fraction was nearly always less inhibitory than the sonicate. The action of acacia gum against suspected periodontal pathogens and their enzymes suggests that it may be of clinical value. The main chemical constituents of Acacia Catechu (Dentosoft ®Natural) are catechin, epecatechin, epigallocatechin, epicatechin gallate, phloroglucin, protocatechuic acid, quarcetin, poriferasterol glucosides, lupenone, procyanidin, kaemferol,L-arabinose, D-galactose.D-rhamnose andaldobiuronic acid, afzelchin gum, mineral and taxifolin. The cutch and Katha (extract) possess astringent, cooling properties; and is commonly used in ayurvedic preparations.. The essential oil In Dentosoft ®Natural) from clove (Syzygium aromaticum) is used as a topical application to relieve pain and promote healing in herbal medicine and also finds use in the fragrance.. Clove oil has two major components, eugenol and β-caryophyllene, which constitute 78% and 13% of the oil, respectively. They are generally recognized as 'safe', but the in-vitro study here demonstrates cytotoxic properties of both the oil and eugenol, towards human fibroblasts and endothelial cells. Clove oil was found to be highly cytotoxic at concentrations as low as 0.03% (v/v) with up to 73% of this effect attributable to eugenol. β-caryophyllene did not exhibit any cytotoxic activity, indicating that other cytotoxic components may also exist within the parent oil. Amomum subulatum in vitro antimicrobial activity of Amomum subulatum and Elettaria cardamomum fruit extracts were studied against Streptococcus mutans, Staphylococcus aureus, Lactobacillus acidophilus, Candida albicans and Saccharomyces cerevisiae. The acetone, ethanol and methanol extracts of the selected plants exhibited antimicrobial activity against all tested microorganism except L. acidophilus. The most susceptible microorganism was S.aureus followed by S.mutans, S.cerevisiae and C.albicans in case of Amomum subulatum while in the case of Elettaria cardamomum; S.aureus was followed by C.albicans, S. cerevisiae and S.mutans. The largest mean zone of inhibition was obtained with the ethanolic extract of A. subulatum and acetonic extract of E.cardamomum against Staphylococcus aureus (16.32mm and 20.96mm respectively). Minimum inhibitory concentrations (MIC) of the extracts were also determined against the four selected microorganisms showing zones of inhibition ≥10mm. This study depicts that ethanol and acetone extracts of fruits of Amomum subulatum and Elettaria cardamomum can be used as a potential source of novel antimicrobial agents used to cure dental caries. Rinsing the mouth with Curcurma Zedoaria gives instant relief.,Massaging the aching teeth with roasted, Curcurma Zedoaria eliminates pain and swelling & relief from gingivitis and periodontitis. The occurrence of dental caries is mainly associated with oral pathogens, especially cariogenic Streptococcus mutans. Preliminary antibacterial screening revealed that the extract of Myristica fragrans, widely cultivated for the spice and flavor of foods, possessed strong inhibitory activity against S. mutans. The anticariogenic compound was successfully isolated from the methanol extract of M. fragrans by repeated silica gel chromatography, and its structure was identified as macelignan by instrumental analysis using 1D-NMR, 2D-NMR and EI-MS. The minimum inhibitory concentration (MIC) of macelignan against S. mutans was 3.9 μg/ml, which was much lower than those of other natural anticariogenic agents such as 15.6 μg/ml of sanguinarine, 250 μg/ml of eucalyptol, 500 μg/ml of menthol and thymol, and 1000 μg/ml of methyl salicylate. Macelignan also possessed preferential activity against other oral microorganisms such as Streptococcus sobrinus, Streptococcus salivarius, Streptococcus sanguis, Lactobacillus acidophilus and Lactobacillus casei in the MIC range of 2–31.3 μg/ml. In particular, the bactericidal test showed that macelignan, at a concentration of 20 μg/ml, completely inactivated S. mutans in 1 min. The specific activity and fast-effectiveness of macelignan against oral bacteria strongly suggest that it could be employed as a natural antibacterial agent in functional foods or oral care products. The influence of the crude and active solvent fraction ofTrachyspermum ammi on S. mutans cariogenicity,. All the test groups showed reduction in caries (smooth surface as well as sulcal surface caries) in rats. Moreover, it also provides new insight to understand the mechanism influencing biofilm formation in S. mutans. Furthermore, the data suggest the putative cariostatic properties of T. Ammi and hence can be used as an alternative medicine to prevent caries infection. Triphala, green tea polyphenols and MTAD showed statistically significant antibacterial activity. The use of herbal alternatives as a root canal irrigant might prove to be advantageous considering the several undesirable characteristics of NaOCl. The essence of entrepreneurship is the ability to spot an opportunity and the willingness to go after it. There are many business opportunities in the market today and anyone can earn a substantial income through this business. The marketing business represent the company that produces the products or provides the services they sell. Here, individuals are offered a long term business opportunities truly protected by contracts based upon the quantity of product sold via their own sales efforts and their down line organization. There are some huge advantages to being the owner of an business opportunity, as here you can invest time according to your convenience. So, why not to start your own business in this growing business category?